Our 12th century fortress, La Fortezza, is the perfect setting for retreats, workshops, events and weddings. The fortress is situated on 27 acres with an organic vineyard on our grounds. All guests enjoy wine from the vineyard, fresh produce from our organic garden, eggs from local chickens, and olive oil from the groves above. The expansive stone barn next to the main house serves as the Studio, and the expansive terrace right off the studio is where we enjoy most meals. The terrace has the most amazing view of the mountains and Moncigoli the charming village located below La Fortezza. It is perfect for a multitude of memorable experiences and gatherings. In the Studio, we also offer a state of the art projection system and of course, wi-fi. We have experience hosting and teaching dozens of retreats, workshops, and events, so we know what it takes to put together an excellent experience for everyone involved. We have an onsite Tuscan chef and can provide transportation and day trips for your students/attendees/staff. Our light-filled outbuildings and guest quarters can accommodate up to 11 guests with a few guests in shared rooms, plus a single room for the group leader (up to 12 people total), and we have access to a fantastic B&B down the mountain along with a gorgeous private villa if you need extra accommodations. We can organize meals and cooking lessons in our rustic, well-appointed country kitchen. We can also orchestrate artisanal food tours, truffle hunting, shopping, historical tours and nature hikes, wine tasting, and olive oil tasting excursions for you and your group. We can assist you in arranging every perfect detail. We can arrange all meals on the grounds on the expansive terrace or overlooking the vineyard, BBQs and parties around our outdoor oven, called a forno in Italian where we can prepare local fare pizzas and focaccia all while enjoying our own organic wine. We will handle everything, so you don't have to do a thing. Whether you're seeking a location for a yoga retreat, artistic workshop or a unique venue for a catalog or client photo shoot, a wedding or a corporate retreat, private group, or a birthday celebration or anniversary party, we'd love to host you at La Fortezza. Annette is an experienced producer and workshop leader, and wrote Picture Perfect Parties, a guide to effortless entertaining. Her new book, Cocktail Italiano, about Aperitivo, the cocktail culture of the Italian Riviera.. Needless to say, she's is the perfect hostess. Annette and her husband Frank, have created the dream location, a one stop shop, in Tuscany. Let Annette arrange anything you desire; her experience will make hosting an event at La Fortezza stress-free and fun-filled. An experience of a lifetime. 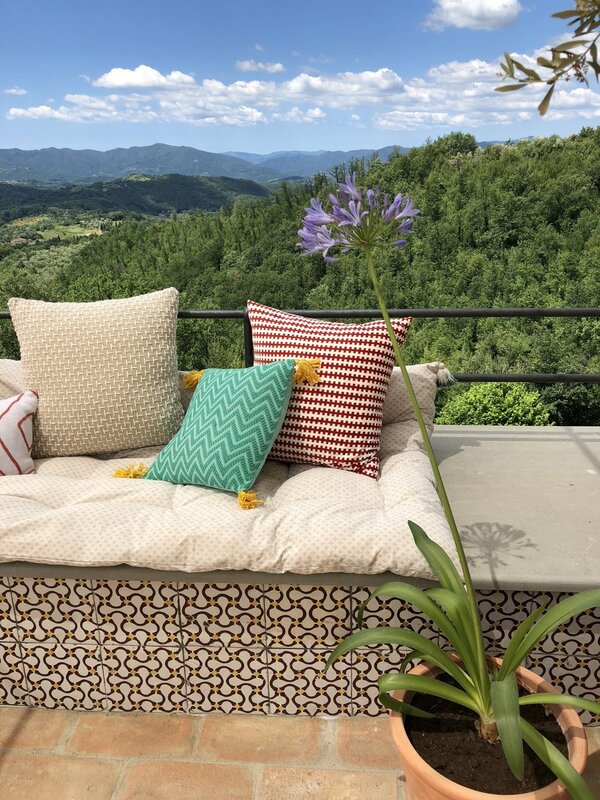 Dine on the expansive terrace overlooking the charming ancient village of Moncigoli and the Tuscan-Emilian Apennine mountain range with signature cocktails in hand while watching the sunset. Experience la dolce vita while hosting a group at a very special location. Email Annette with requests. Our calendar is filling up, so don't delay.